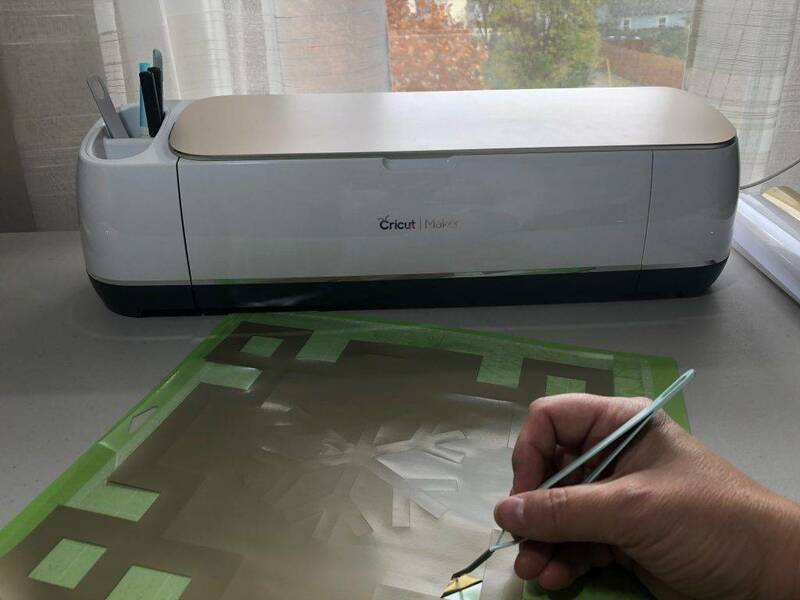 Decorating for Christmas can be so much easier when you use your Cricut Maker! 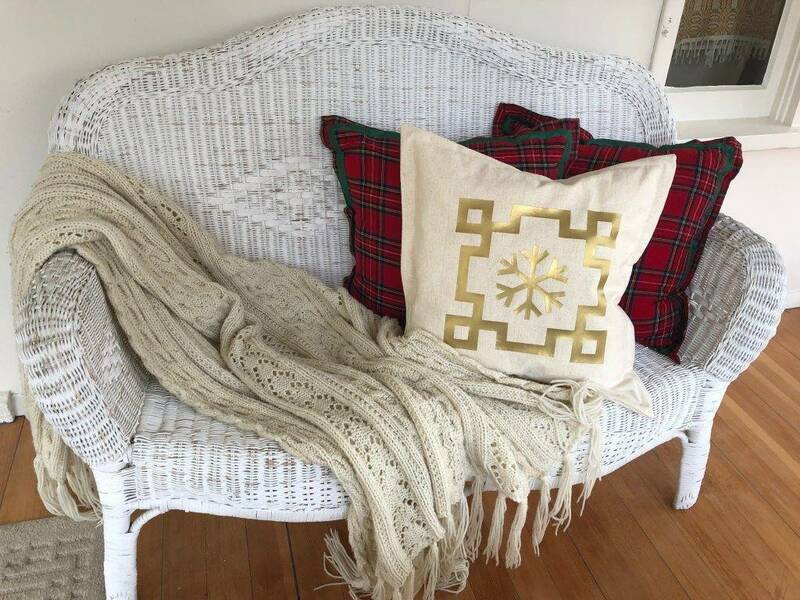 This Christmas stocking and holiday pillow are just the things to make your home have holiday spirit! 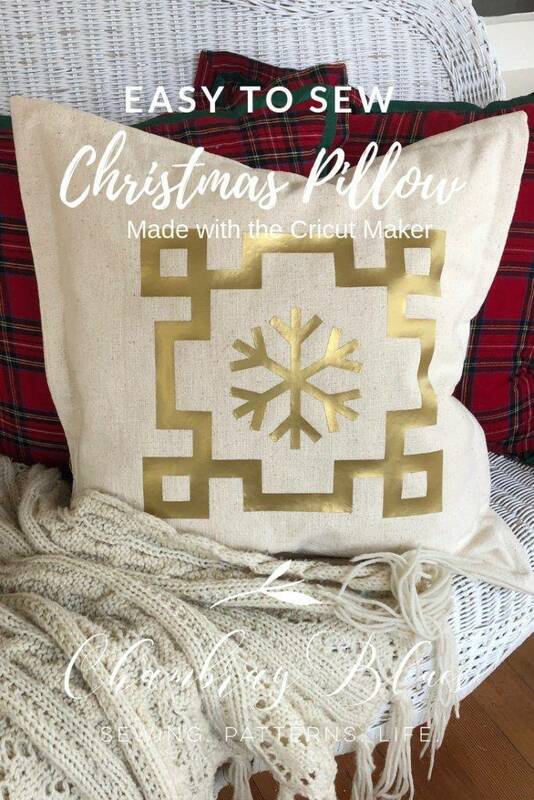 This pillow is easy to sew, and decorate with your Cricut Maker. This post is sponsored by Cricut, any opinions given are completely my own. For a complete list of rules, see the disclosures page. 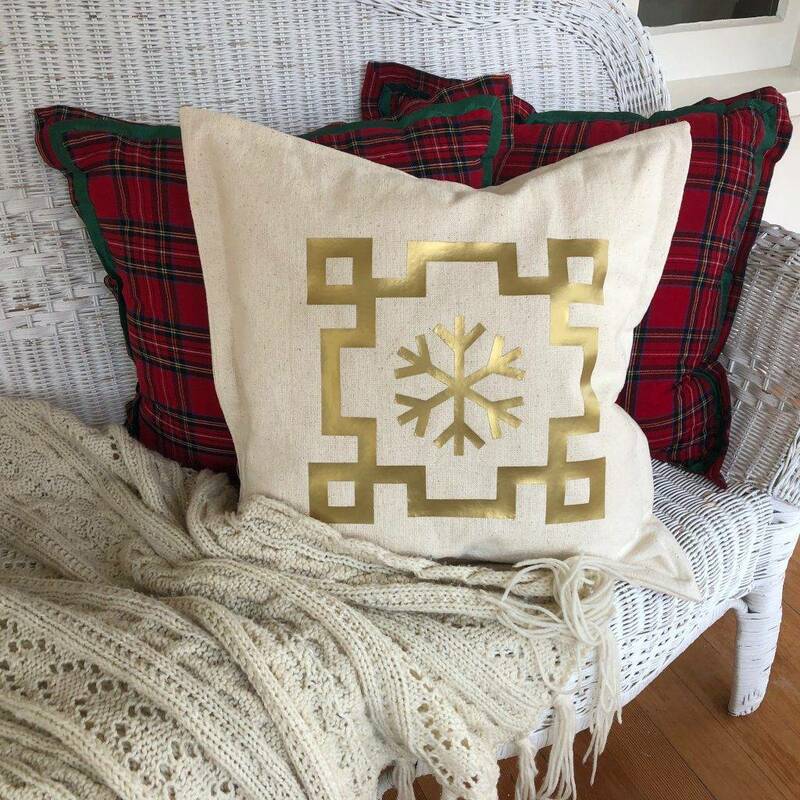 You will love this easy project, simply cut the vinyl and press onto the pillow! Weed out the negative space in the design. 1. 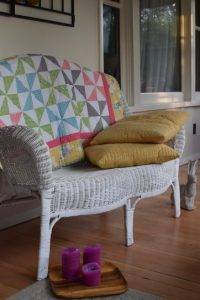 Cut the fabric down to a square 23″ wide. 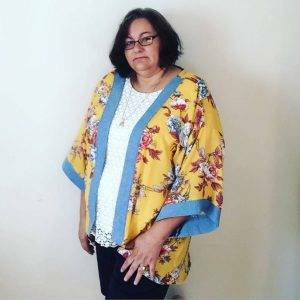 Turn fabric right sides together, stitch around the outside edge with a 1/2″ seam allowance leaving an opening at the bottom edge 8″ wide to insert the pillow. 2. Press, turn right side out. Press again from right side. 3. To make the flange, top stitch 1″ from edge all the way around the pillow leaving the bottom open as before. Press. 4. Cut the vinyl on the Cricut Maker according the directions on the Cricut website here. Be sure to use the knife blade on the vinyl setting. Also, be certain to place the vinyl shiny side down on the standard grip mat before cutting. I used my large Easy Press 2 for this project. 5. Weed out the excess vinyl from the snowflake design. 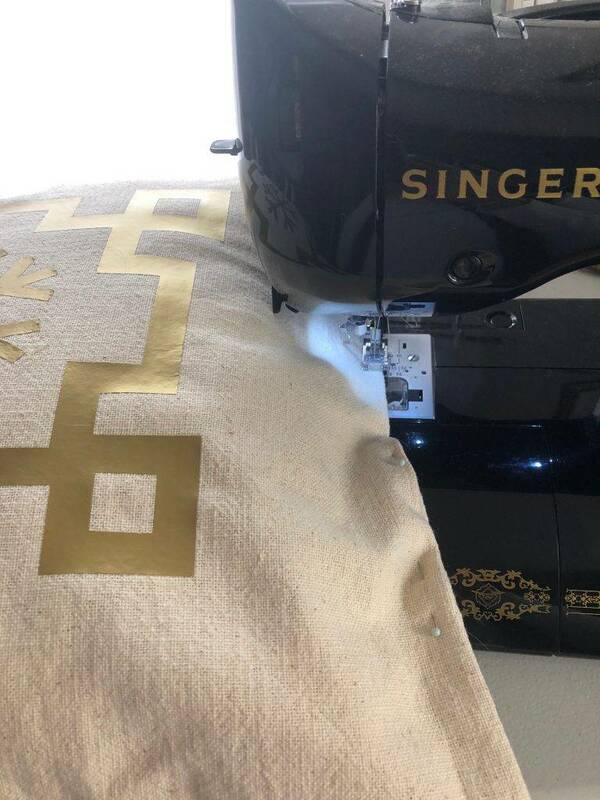 Place the vinyl on the canvas pillow cover with the sticky backing down on the fabric. 6. Pre-heat your Easy Press 2 to 290 degrees, or iron to the high or cotton setting. I loved the using the new large Easy Press 2, worked great for this project! 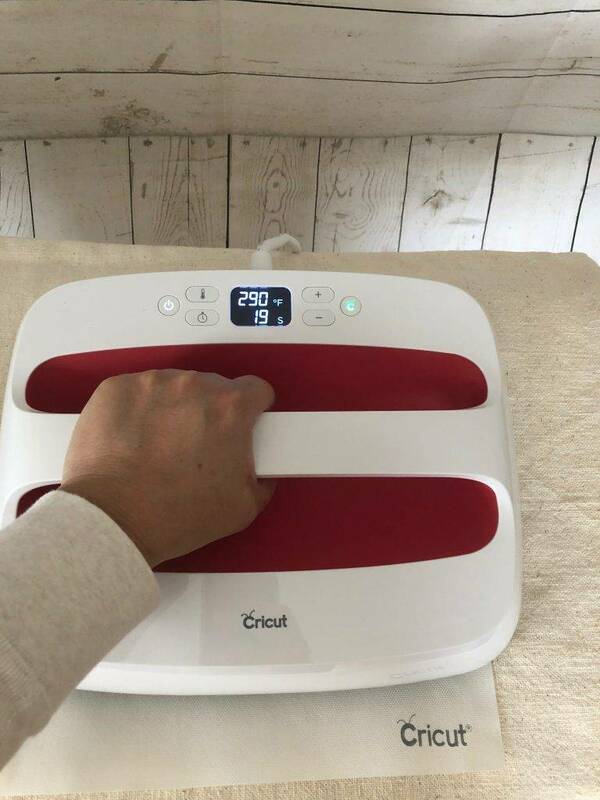 Using a press cloth or Cricut Silicone mat, press for 30 seconds. Turn the pillow over, and press again on the back side for another 30 seconds. 7. Let cool slightly, remove the clear vinyl backing. Sew the pillow, insert the form. Then close up the seam from the outside. 8. Insert pillow form, stitch bottom opening closed. Keep your floss on a ring for easy stitching! The second project I made is this pretty felt stocking. 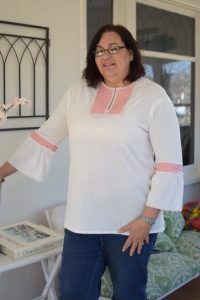 This is a really fun project to work on your hand sewing and embroidery skills. I haven’t embroidered in a long time, and I really enjoyed working on this project. It’s perfect for keeping your hands busy while watching TV in the evenings. Don’t be intimidated by it, there are only 3 stitches in this entire project. 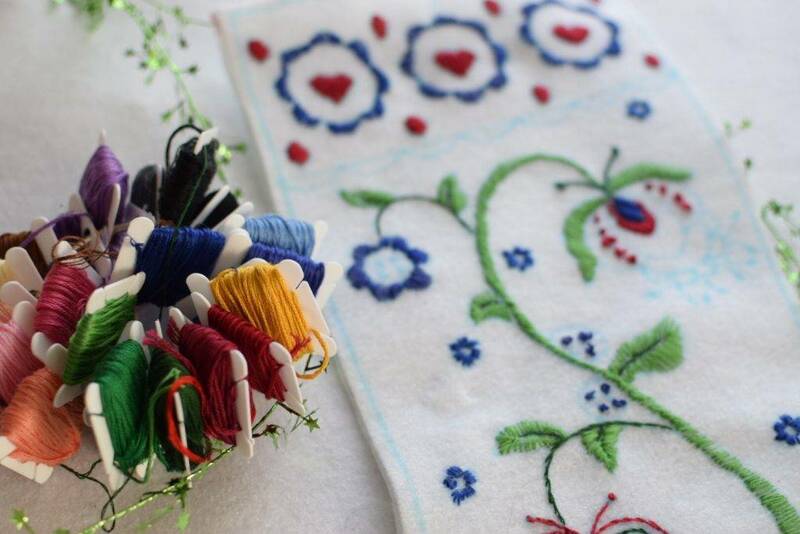 They are the satin stitch, the french knot, and the outline stitch. The Cricut draws the initial embroidery design on the felt, and cuts the stocking out at the same time. As you hand embroider you can use a hoop if you desire. To me, it seemed awkward so I didn’t use one. The felt is quite solid and easy to work with without a hoop. I found this embroidery floss ring organizer at the craft store. It made it easy to find the right color floss and unwind it as needed. Only use 2-3 strands of floss at a time as you work. Excess strands of floss can be re-wound on to the plastic tab until needed. I am working on a video demonstrating the stitches and it will be on my You Tube channel soon. 3. Embroidery floss in these colors: dark green, light green, red, dark blue, light blue, yellow, orange and pink. 4. Cricut fabric marking pen. Embroidery takes a little patience but is well worth the effort! 1. Cut the felt to 12 x 24″ as described on the Cricut website here. 2. Insert the fabric pen into the Cricut Maker along with the Rotary fabric cutting blade. 3. 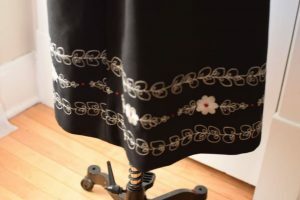 Draw and cut the fabric with the Cricut. 4. Remove the stocking from the mat. Embroider according to the Cricut website directions, you can print the pdf document here with the directions. 5. 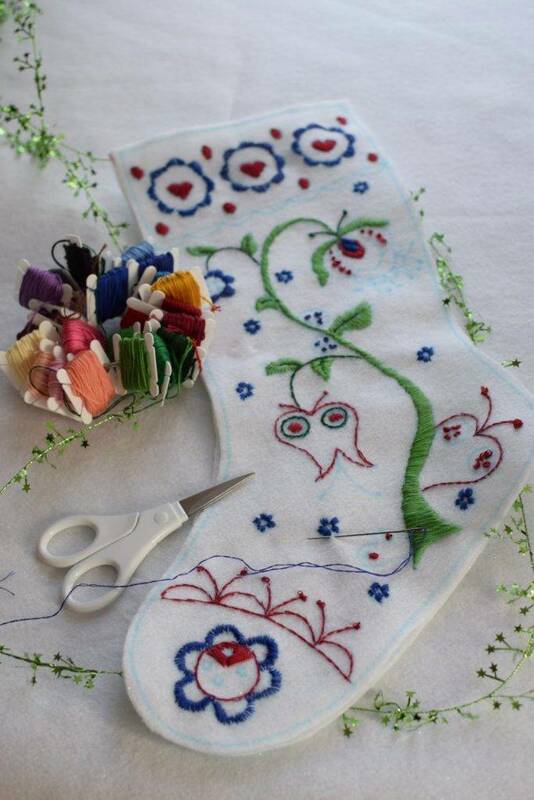 After embroidering, sew a 1/4″ hem on the top edge of each stocking piece. 6. Stitch stocking together by sewing along the outside edges along the marked line. 7. 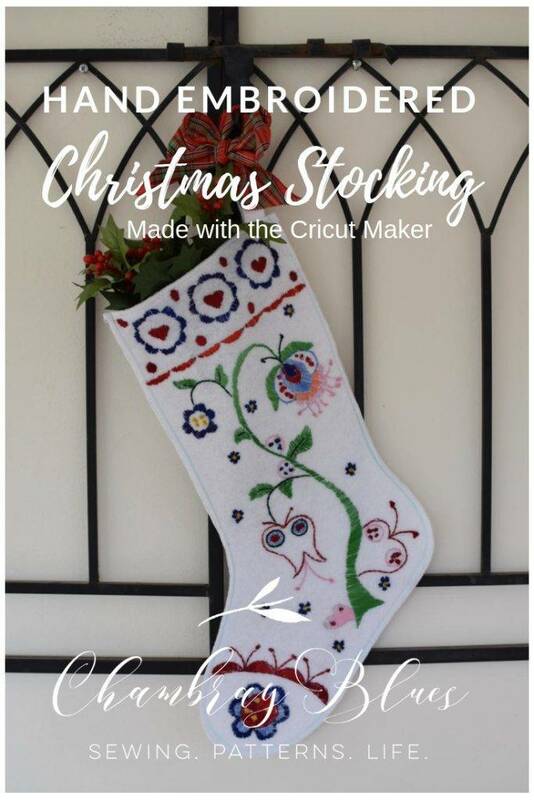 Sew the piece for the stocking hanging loop by folding a rectangle of felt into thirds and stitching along the entire length with a zig-zag stitch. 8. Attach the loop into the corner of the stocking with a single needle top stitch. 9. 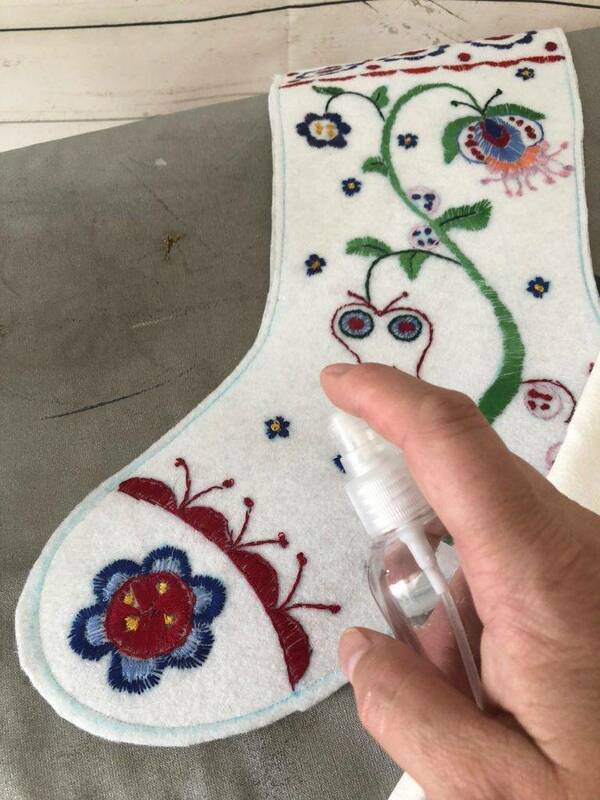 Spritz the stocking with water to remove the fabric pen marks. Cover with a press cloth, press to remove the marks. You may have to repeat the process a few times until they have all disappeared. Remove your fabric pen marks by spritzing the mark with water, cover with a press cloth and press. 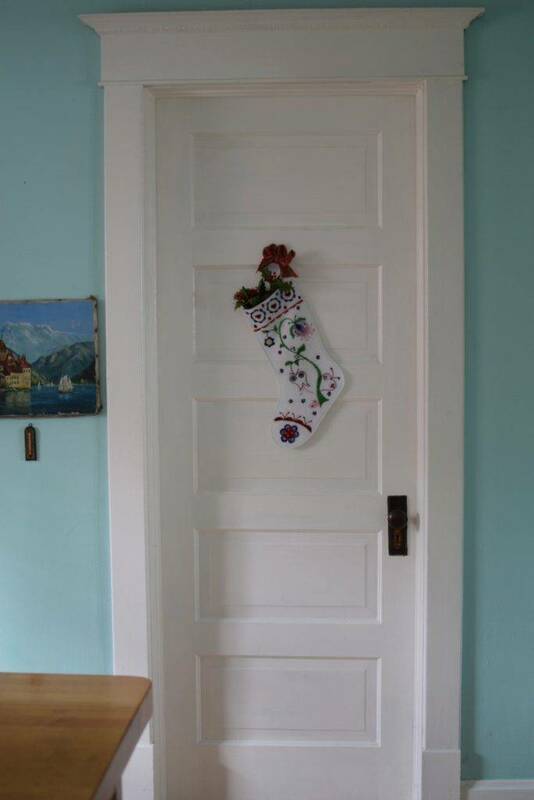 Love how this stocking turned out! I spent about 15 hours doing the embroidery for this stocking. 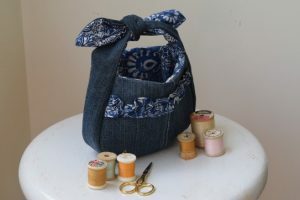 I found it very relaxing to sew in the evenings when I was too tired to accomplish anything else. 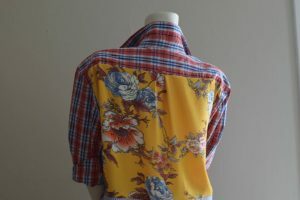 It’s great to have a hand sewing project to work on a little each day, you will be amazed at how fast it comes together! 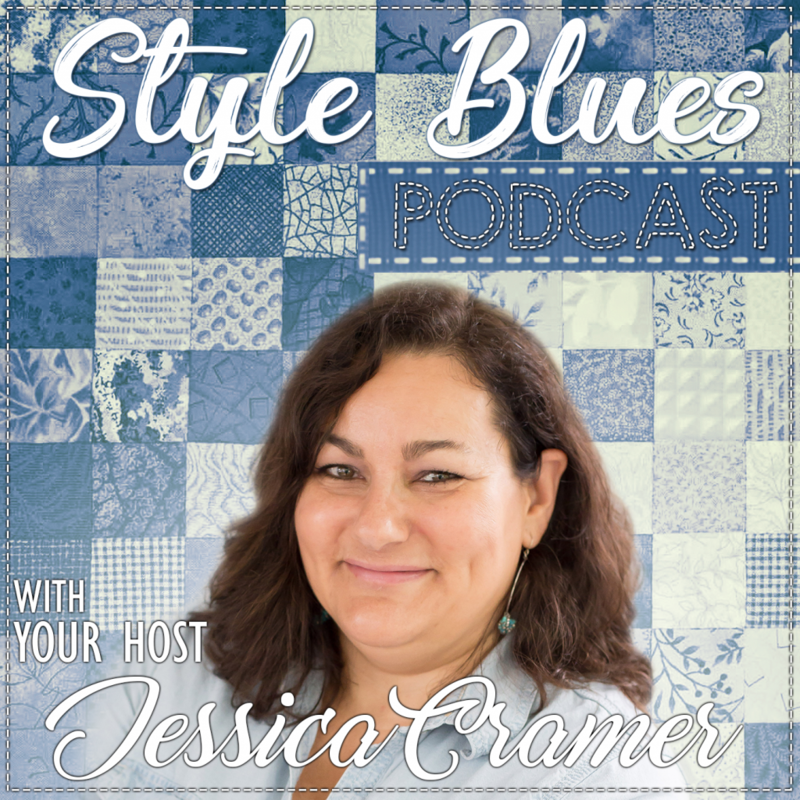 If you are a more experienced embroiderer you could probably do it in less time. I haven’t embroidered in many years, and it took me a while to get back into the swing of things. Now that I have done it, I am looking forward to my next hand sewn embroidery project. I love how colorful it is in our kitchen! Thanks to Cricut for sponsoring this post!